As far as anything concrete on ‘Top Gun 2‘, we don’t have a director, a dash of a plot that will explore drone warfare putting an end to the fighter pilot era, but no more. Well, there is one more, tiny thing, Tom Cruise has signed on as well. We’ve got our Maverick and we’ve got our Iceman. Kilmer is the first person to point out that the concept is a long way from becoming an actual movie and there are many puzzle pieces that need to fall into the right places before this could happen, but the one thing we know for sure is if they want Kilmer, they’ve got him. 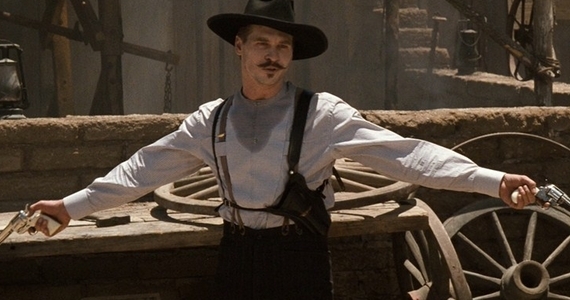 Kilmer can do anything and he’s got such a fantastic acting range, he’s just phenomenal. For my money, while I wait for ‘Top Gun 2′ to come to fruition, I’m checking out some classics from the Kilmer vault – The first ‘Top Gun‘, of course, ‘The Doors‘ where his Jim Morrison is spot on, ‘Tombstone‘ with the most perfect Doc Holliday performance in history, and one of my absolute favorites, ‘Kiss Kiss Bang Bang‘ where he plays the hilarious, and convincing Gay Perry. 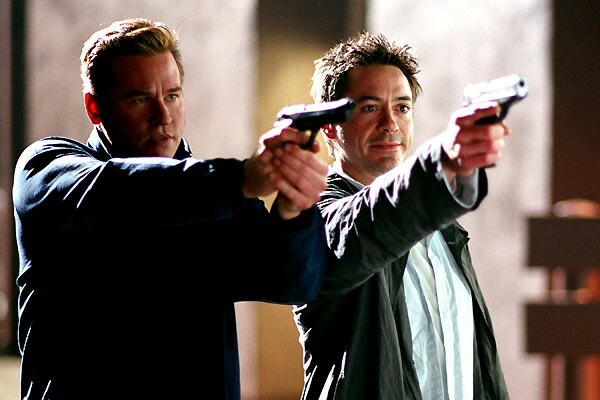 Seriously, if you haven’t given ‘Kiss Kiss Bang Bang‘ a shot by now, I’m begging you to watch it, it’s hilarious, it’s a mystery and Robert Downey, Jr. pees on a corpse, and kisses Val Kilmer. Not at the same time or anything, what kind of sicko are you? Just watch it. I Can’t Believe My Eyes – Is ‘Top Gun 2’ Heading For The Runway?!!!!! Oh My Giddy Aunt, ‘Top Gun 2’ Is OFFICIALLY In Production!!! This entry was posted on Tuesday, November 17th, 2015 at 2:58 pm	and is filed under News. You can follow any responses to this entry through the RSS 2.0 feed. You can skip to the end and leave a response. Pinging is currently not allowed. « The Future Looks Bright For ‘The Fast And The Furious’!! !